After 32 games on the road, the University of Maine baseball team played its home-opener on Tuesday night and defeated Colby 4-2. Joey Martin (Portland, Maine) had three hits and an RBI for the Black Bears in the win. Maine improves to 13-20 on the season with the win, while Colby falls to 10-15. Maine struck with three runs in the bottom of the first inning. Michael Fransoso (Portsmouth, N.H.), who had two hits and scored two runs in the game, singled through the right side. Taylor Lewis (Montville, Conn.) followed with a single to third base. Martin also singled to load the bases. Justin Leisenheimer (Middle Village, N.Y.) was hit-by-a-pitch forcing home Fransoso. Fran Whitten (Westborough, Mass.) hit a sacrifice fly plating Lewis. Leisenheimer scored the third run of the inning when Tyler Patzalek (Burlington, Ontario) got caught in a run down. Colby got on the board with a run in the top of the third inning. Richard Newton walked and scored when Brendan Gallagher doubled to left field. The Black Bears tacked on an insurance run in the bottom of the eighth inning. Fransoso led off the inning with a single. 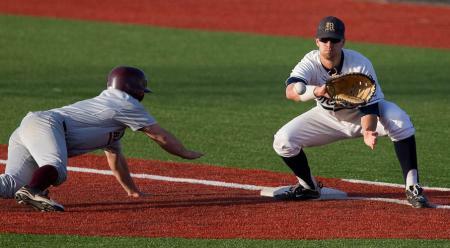 He then stole second and advanced to third on a Lewis sacrifice bunt. Martin then flew out to center field scoring Fransoso. Colby added a run in the top of the ninth inning. John Lerner, who pinch hit for Nathan Ellis, singled to center field and scored when Nikolas Atsalis singled to right field. Brandon Nieuw, who had walked, was stranded on third base. Jonathan Balentina (Willemstad, Curacao) allowed just one run on four hits over four innings. He struck out seven batters and picks up the victory. He moves to 1-1 on the season. Stephen Perakslis (Abington, Mass.) went two innings and did not allow a run on three hits. He struck out three. Shaun Coughlin (Northfield, Conn.) went 2.1 innings. He allowed one run on a pair of hits. D.J. Voisine (Plainville, Conn.) got the final two outs to earn his second save of the season. Dakota Rabbitt went five innings for Colby. He allowed three runs on five hits while striking out one. He falls to 1-1 on the season. Greg Ladd pitched the final three innings. He allowed one run on three hits. Maine returns to action on Saturday, April 23 when it hosts Albany for a doubleheader. First pitch is scheduled for 1 PM.